I can’t say that I like the way most Scotty Cameron putters sit upon address, but the Newport is the exception. It has an extremely solid feel on impact and does not have a hook face at address. It sits square to the target. One caveat on this putter is that it’s heavy. You need a very solid putting stroke to be able to handle a putter this heavy. It requires rhythm in your stroke. The brushed chrome head is beautiful to look at and it’s easy to see that the materials involved in producing this putter are more extensive and expensive than competitor brands. Thus the higher price on this putter. 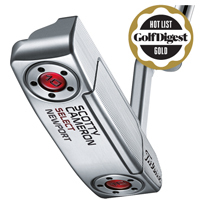 The milled design on the putter face will help you put top spin on the ball if you so desire. I like the traditional blade design on this putter best of all the Cameron putters.